Hanoi (VNA) – The Appeal Court of Cambodia on August 11 upheld the ruling of a lower court to sentence, in absentia, Sam Rainsy, former President of the opposition Cambodia National Rescue Party (CNRP), to 20 months in prison for defaming Prime Minister Hun Sen.
Last March, the Phnom Penh Municipal Court sentenced Sam Rainsy to one year and eight months in prison and fined him 10 million Riel (2,500 USD) for his involvement in accusing PM Hun Sen and the Cambodian Government of standing behind the murder of political analyst Kem Ley. 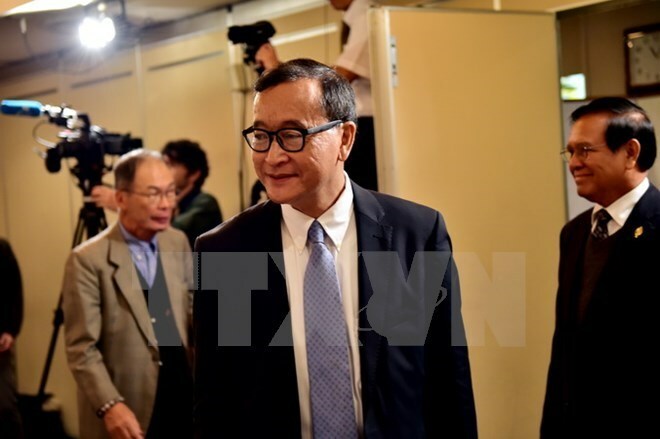 Sam Rainsy was charged with defamation and incitement to cause social chaos according to Articles 305, 494 and 495 of the Penal Code. He has been living in exile since November 2015 to avoid a two-year imprisonment for defaming Deputy Prime Minister Hor Namhong. He had also been given other sentences in Cambodia.